The Melksham Railway Development Group is minded to change its name to the Melksham Rail Users Group. The group was formed many years ago to encourage the development of the station, which re-opened in 1985 with ten trains calling per week and with just a 'bus shelter' on a short bare platform. The station and service has had its ups and downs, but with much improved facilities now available and with over a hundred calls per week, supporting existing users and encouraging new one has become a key community role with station development remaining important but dwarfed by the user element, and to be supported by the ongoing requests and desires of the current and future user element. The name change is the main agenda item for the next meeting - 24th June, 19:30, Melksham Town Hall. All welcome. Good to have considerable local interest and support at today's 'Station to Station' celebration. On the evening of Friday, 24th June 2016, the Melksham Railway Development Group was renamed the "Melksham Rail Users Group". In 20 years since the group's formation, passenger numbers using Melksham Station have risen 20 times - from 3,000 to 60,000 journeys a year, and the group has developed the station from virtually nothing into a facility used by hundreds of people a day. Looking after those customers - ensuring that they have the best service that can be provided for them, ensuring they're informed, and picking up and answering questions, issues and suggestions they have is a growing role, overtaking the continuing role of developing the station and services. Mark Hopwood, Managing Director of Great Western Railway who operate trains to over 270 stations, writes "... has let me know about your plans to change the Melksham Railway Development Group into the Melksham Rail Users Group. This is another important milestone in the development of the line and recognises that the TransWilts, and Melksham station, are truly up and running and working well. "Everyone at GWR is so pleased with the phenomenal success of the line since we worked with you, and Wiltshire Council, to provide the extra services, and we look forward to further improvements. "The Melksham Group has worked incredibly hard to transform the provision of services. 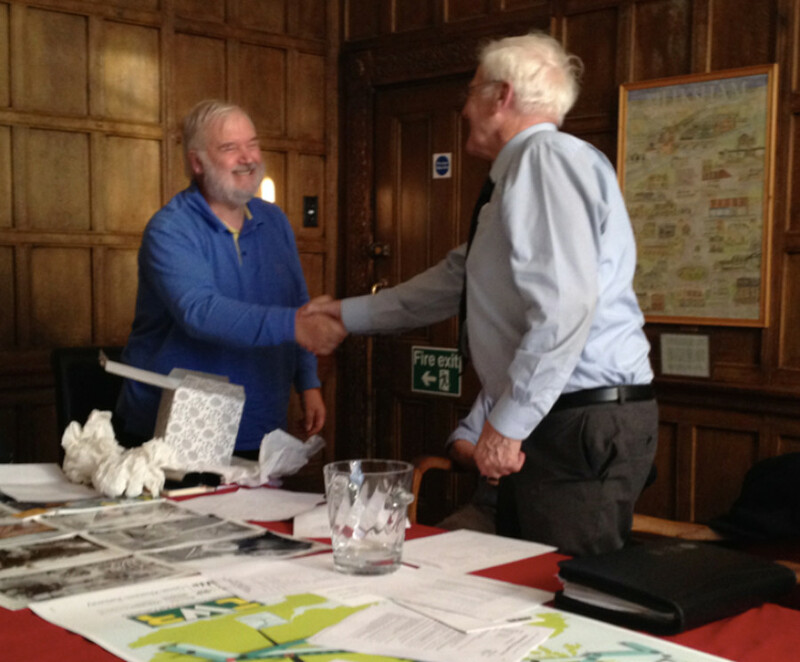 You should be very proud of all you have achieved and I wanted to formally record my gratitude and thanks; with your track record I know you will be an active, and enthusiastic Rail Users' Group and we look forward to continuing our work with you as Melksham continues to go from strength to strength." Paul Johnson, chair of the TransWilts CIC, presented the chair of the Rail Development Group - Peter Blackburn with a crystal vase to celebrate the success of the group on this momentous evening, and congratulated the longstanding members present on their success. Present, and of service to Melksham's rail services for the majority of the life of MRDG were John Money, Peter Blackburn, John Hamley, Alan Baines, Rolf Brindle and Lee Fletcher. And there were sufficient newer and new members to fill our venue to capacity. The Melksham Rail User Group is a member of the TransWilts Community Rail Partnership - the rail industry, local government and the community working together. "TransWilts" is constitued to look not only at the Swindon to Westbury train service via Melksham, but also connecting and other public transport to, from and within Wiltshire. Paul Johnson (chair of TransWilts) looks after strategic development of services and facilities. He described to the meeting how passenger numbers have increased dramatically over the past three years, and how both services and station facilities need to be enhanced for the future. Although passenger numbers have risen 20 fold in the past 20 years, they should rise still further; if Melksham were to make the same use of its railway station as other comparable towns in Wiltshire, passenger numbers will rise another five fold in coming years - and that means we need more and longer trains, and substantial changes to the station. Early work looking at schemes, planning what's best and consulting with stakeholders is underway so that we can move towards a "shovel ready" scheme to be implemeted when an opportunity such as the Station Regeneration scheme (central funded / see 10.4.16 prss release) and to ensure that train service reflect gwoing local need as timetables change on main line electrification and cascade. Paul also talked about the recognition of the services as a "designated service" - currently being considered by government after a consultation earlier this year; if and when granted, that would give our community and council group some extra inputs and freedoms for local tuning of the service, a small additional funding stream, and a more formal seat at the table for certain national discussions which effect all lines including ours. Graham Ellis (TransWilts Community Rail Officer and vice chair of the Melksham Rail Users Group) looks after tactical service development. He described his role in promoting the current service, ensuring that passengers and potential passengers have the information they need, and in feeding back comments, ideas and requests to the train operators (Great Western Railway) and local transport authority (Wiltshire Council). 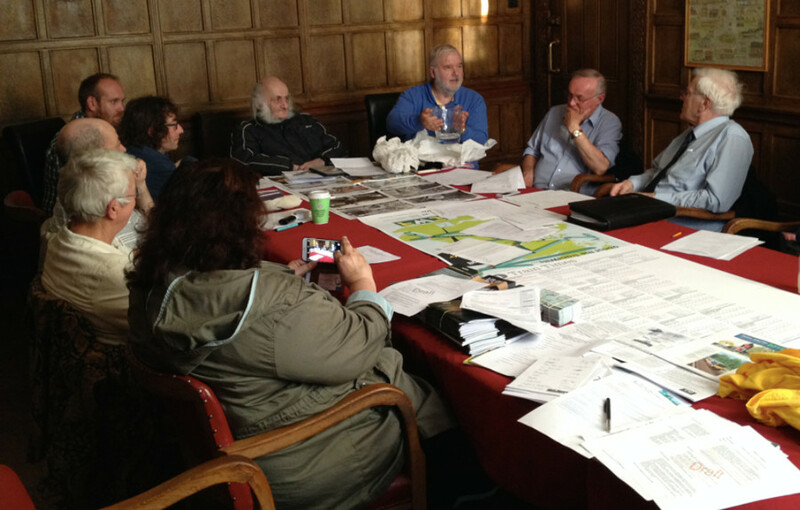 This is a very wideranging role, and user groups, passengers, volunteers (and rail staff) are Graham's eyes and ears. Graham reported that the new lunchime trains which started running last month are already seeing good passenger numbers, other offpeak trains doing well, with peak train getting nearly full. Car parking is free for train users at Melksham Station, with a few spaces remaining available every day for new users. 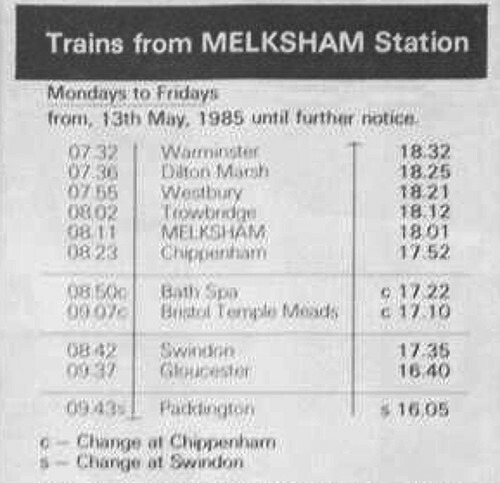 Issues raised at the meeting including the complexity of tickets, and the need for further trains, leaving Melksham between 07:50 and 10:05 for Swindon, and returning from Swindon at about 16:30, leaving Melksham at around 08:20 for Westbury, and a later evening train. Keeping the car park tidy, having buses stop near the station, and the difficultly of seeing the display on the ticket machne were also raised. But overall everyone's happy with the service and re-assured the the matters mentioned here are 'on the radar' if not easily or quickly fixed. 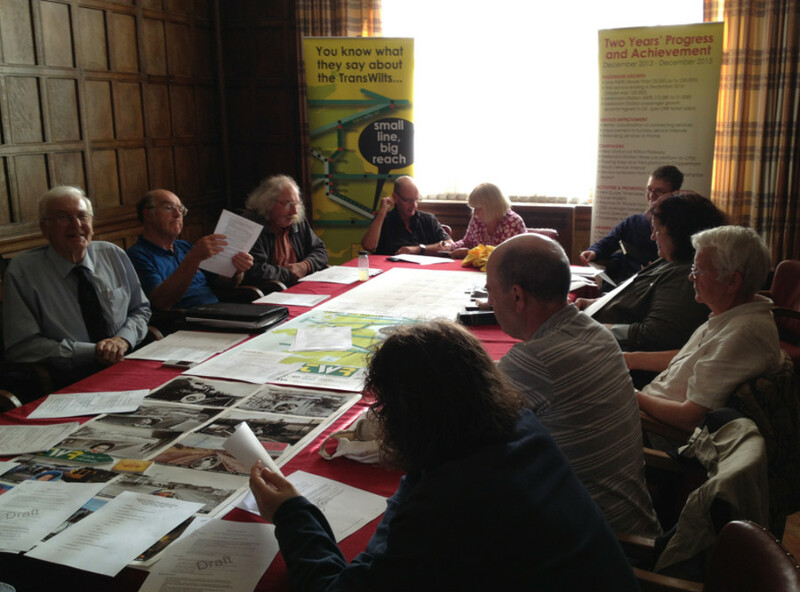 ... on 11th July, Paul Johnson's discussing further strategic plans with local stakeholders for Melksham Station including better access, longer platform and more services. ... 16th to 18th July, we're doing passenger surveys of all TransWilts users to learn more about how the use of the line has changed, and people's journeys to and from the station, and aspirations. ... on Sundays throughout July, why not catch the 09:52 train for a day at the seaside at Weymouth? Congratulations on their achievements so far, and very best wishes for the future, to the Melksham Rail Users Group. The next meeting of the Melksham Rail User Group will take place on Wednesday, 5th October 2016 (postponed from 30th September as several of the officers will be at a national event 'up north' the night before). Venue - Well House Manor, 48 Spa Road, Melksham (that's the CRP offices) - arrival for MRDG / MRUG 20 year celebration from 18:30, any key business from the usual time of 19:30.